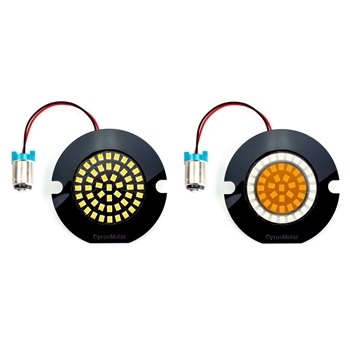 CyronMotor AC11 series are LED inserts for turn signal lights mostly in Harley Davidson motorcycles. Unlike other lights in the market that have narrow angles of light using old technology LEDs, AC11 series use 120 degrees ultra wide viewing angle SMD LEDs. Offering such a wide viewing angle makes this turn signal visible from adjacent road lanes, where it counts the most. When turning or changing lanes normally vehicles and pedestrians in 30 or 45 degrees off axis are most important to be alerted. More than 3 times more effective light in such angles makes AC11 series a clear winner. AC1157PAAW has a white halo in run mode, and amber center section that turns on when turn signal is turned on. It is well suited for front turn signals only. The transition between amber turn signal to white halo is a cool slow fade. Not only a cool effect, but also it helps to visually separate the two modes of light. It is best to change the stock colored lens to smoke or clear so the white halo is viewed as white. Do I need a load equalizer module? Changing front and rear on 2014 and older touring models requires adding a load equalizer if you want to avoid hyper flash (fast flash of turn signal). If you are changing only the front or the rear to LEDs, a load equalizer is not needed.